My twitter timeline last night was full of this news. 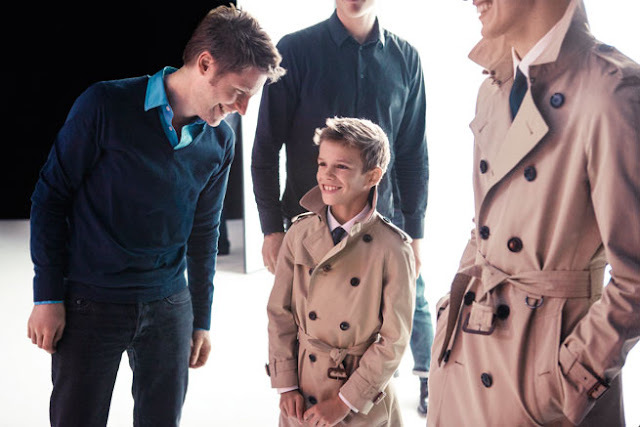 Romeo Beckham is on the ad campaign for Burberry Spring/Summer 2013. Trying to beat Hudson Kroenig? Well, in ads, you stay on let say, Times Square, or side of a double-decker bus longer than in a 15 minutes fashion show. Ant this is the video of the ads. He's fun, no? Clearly that he smiles a lot. 10-year-old + white shirt + black tie + trench coat + business trousers + shiny leather shoes + umbrella = ONLY Beckham junior can it be. It looks like he's a regularly-checking-weather successful business man. Oh, he perhaps lives in London so he doesn't need to check weather. It rains. Like always. When you have the most fabulous parents on earth, with their super DNAs combined together, there's no doubt that you will have a wonderful hidden talent and persona. After I watched the vid, I recalled Hermione Granger, well-played by Emma Watson, who's previously became the face of Burberry too. She, Hermione, is super smart witch who's by chance has both non-witch parents (Muggles). I also recalled a movie about superhero mom and superhero dad who have a son attending a superhero school who's in the very beginning has nothing special. His father is strong as rock, and his mother can fly, but he has no capabilities in either way. But it turned out a happy ending story (and I hate happy-ending movie), that he actually has both of his parents heroic power. So, will Romeo have the hard-to-resist cuteness with inevitably marvelous fashion taste like his father and fierceness with good instinct of business and beauty like his mother when he's a little bit more growing up?